Children of all ages are welcome to join in the Snoopypalooza Scavenger Hunt during regular museum hours. You can combine a fun activity for the kids with shopping and running errands at the Elmhurst City Center. All children must be accompanied by an adult to participate in the scavenger hunt. The lovable comic strip character of Snoopy appeals to people of all ages. You can learn more about the cute canine at the museum’s current exhibition, Snoopy and the Red Baron. 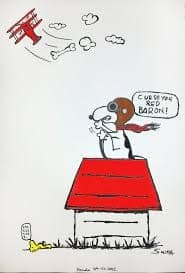 In his imagination, Snoopy becomes the Flying Ace, a daring World War I pilot determined to defeat the dastardly Red Baron. He does it all from atop his doghouse, which is featured in the exhibit. There will also be lots of other Snoopy character collectibles, toys and books on display. You can even stand next to Snoopy’s doghouse and take selfies in his aviator cap and googles! There are Snoopy events happening all week at the museum, so visit the website for details. The Snoopy and the Red Baron exhibit is on loan from the Charles M. Schulz Museum and Research Center in Santa Rosa, California. Tuesday through Friday, 1-5 p.m.
Saturday, 10 a.m.to 5 p.m. Call 630-833-1457 or visit www.elmhursthistory.org/323/Family-Programs.org.